To many people, a horse’s hoof may look like a solid object, tough and hard all the way through. However, that isn’t the case. The hoof is made up of several different layers and structures, each with a specific function. Horses have evolved from the four-toed, dog-like eohippus into the single-toed creature we know today. Evidence of the vanished toes remains. The chestnut and ergot are cartilage-like protrusions along the inside of the horse’s legs, and on the underside of the pastern joint. On some horses, they grow rapidly and although no harm is done if they are left to break off naturally, they are sometimes trimmed for a neater appearance. There are two bones that run down either side of the horse’s front leg between the knee and pastern joint. These two splint bones are believed to be what remains of the former toes. There are three bones inside the hoof. The longest is the short pastern bone that extends down from the long pastern bone in the horse’s leg. The largest bone within the hoof is the pedal or coffin bone. Within this bone are many minuscule passageways for blood vessels and nerves. Beneath the junction of the short pastern bone and the coffin bone sits the small navicular bone. Several tendons and ligaments run down from the leg and attach to the bones within the foot. Surrounding these bones is the sensitive laminae. This is a layer of tissue that carries blood to all the components of the hoof. Beneath the sensitive laminae and bone structures sits the digital cushion. 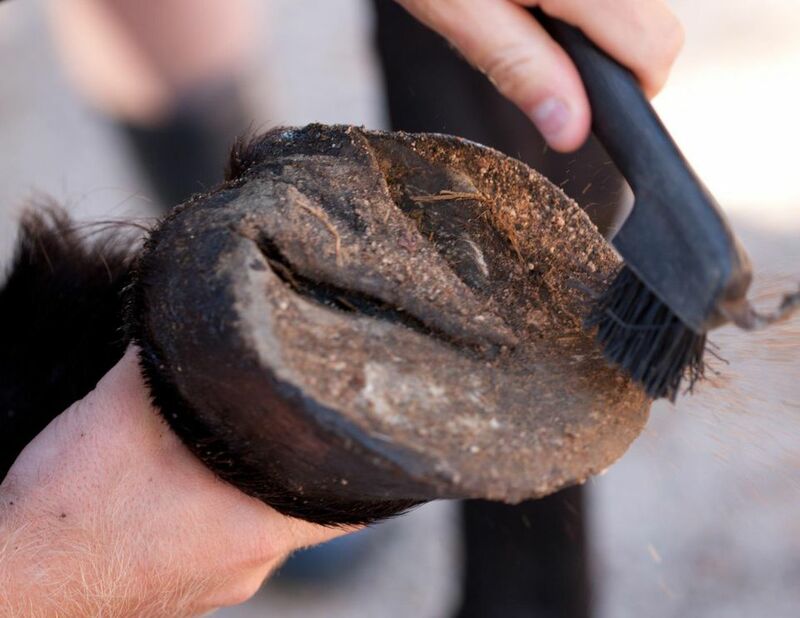 This is a rubbery pad of tissue that forms the heel of the hoof and helps absorb the shock as the horse’s hoof makes contact with the ground. Surrounding the sensitive laminae is the horny laminae. This layer is quite hard and has no feeling. It attaches to the outer wall of the hoof in a similar fashion to hook and loop fastener. The margin where the wall and the horny laminae attach is called the white line, which provides the farrier with a visual indication of how deep he can trim the hoof, and where to set in the nails for horseshoes. The wall is similar in composition and function to our fingernails and is constantly growing. The wall of the hoof can be very thin, or very thick depending on the type of horse, its nutrition and environment. Wild horses wear down hoof growth naturally, but domestic horses require regular trimming by a farrier. The color of the hoof is influenced by the color of the skin above it. If a horse has white markings directly above the hoof, the hoof wall may carry down the same pigmentation. Many people believe that hooves with black walls are stronger than hooves with white walls. This is not true. The very outside of the wall is protected by the periople. This layer protects the moisture within the hoof. The coronary band runs around the very top of the hoof. This is a blood-rich band from which the hoof grows, somewhat similar to the cuticle on our fingernail. Severe damage to this band can cause deformities of the hoof wall. On the underside of the hoof is the sole. This is a concave, thick but flexible padding of hard tissue that protects the sensitive sole directly beneath the bones of the foot. In the middle of the sole sits the V-shaped frog. The frog contacts the ground surface as the horse travels and helps the blood circulate in the foot. The cleft of the frog runs down the middle of the frog and aids in flexion and grip. The bars of the foot run on either side of the frog, and they provide stable suspension for the walls and frog as the horse’s foot impacts the ground. Domestic horses require daily foot care to stay healthy. It is important to clean dirt and manure from the underside of the hooves as well as remove any lodged rocks, sticks or even pine cones that can cause discomfort and bruising. As you visually check your whole horse, look for any swelling or cuts around the foot. If your farrier recommends it, coat your horse’s hooves with a moisturizing dressing when grooming. If your horse has weak hoof walls consider trying one of the many feed supplements that claim to benefit hoof growth. About every six weeks, a farrier should trim down growth, help correct any hoof problems and suggest proper care depending on your horse’s use and environment.